Eurocom offers a variety of fully upgradeable and customizable, high performance laptops that support the best available graphics, NVIDIA GeForce GTX 800M series included. Having the ability to customize your system allows users to have the perfect configuration for their needs and pay for only what they need. A variety of performance levels are offered with the line of graphics to allow customers to choose the precise performance level. Thin and light notebooks from Eurocom have traditionally blended performance and mobility extremely well. Performance is now enhanced with integrated NVIDIA GeForce GTX 860M and 850M graphics for epic performance on the go. The top to bottom line of new GPUs are faster and more power efficient than the previous generation and offer a multitude of cool new features. 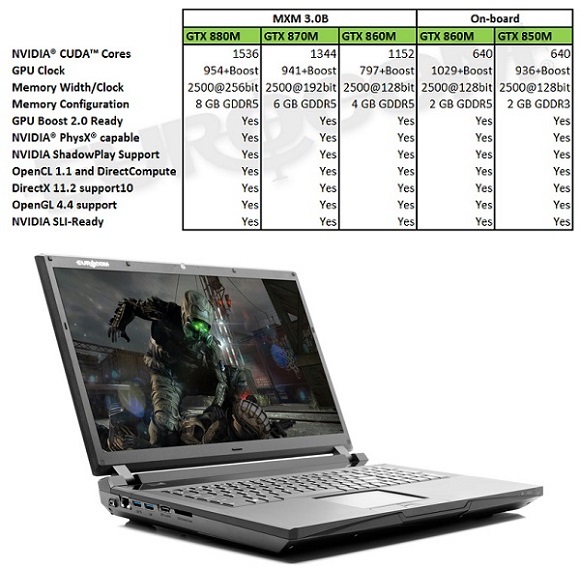 It includes the world’s fastest notebook GPU, the NVIDIA GeForce GTX 880M, as well as GeForce GTX 870M, GeForce GTX 860M and GeForce GTX 850M enthusiasts GPUs. These GPUs feature blazing performance, battery saving technologies such as new NVIDIA Battery Boost, and the addition of cool new gaming features such as ShadowPlay and GameStream. Performance is unmatched with 4th Generation Intel Core i7 Extreme processors and NVIDIA GeForce GTX 880M graphics in select Eurocom notebooks. Having the ability to add up to 32 GB memory ensures nothing will slow these beasts down. To store the latest games and software select Eurocom systems support up to 5 storage drives, with 2 mSATA solid state drives waiting for fast boot up times and blazing responsiveness.